The Government has already announced that they will give greater long-term incentives to burning millions of tonnes of wood in power stations than to onshore wind and solar PV, both of which have a fraction of the land and carbon footprint of big biomass. Now the Government are consulting on proposals to further advantage biomass ‘combined heat and power’ (CHP) plants (and possibly coal-to-biomass conversions) as a ‘less established technology’, whereas onshore wind and solar PV will be considered “more established”. While most people associate biomass CHP with small-scale, efficient district heating systems, this is not what’s being promoted here. The ‘CHP’ plants which the subsidy rules favour are big, centralised power stations with just 35% efficiency (i.e. 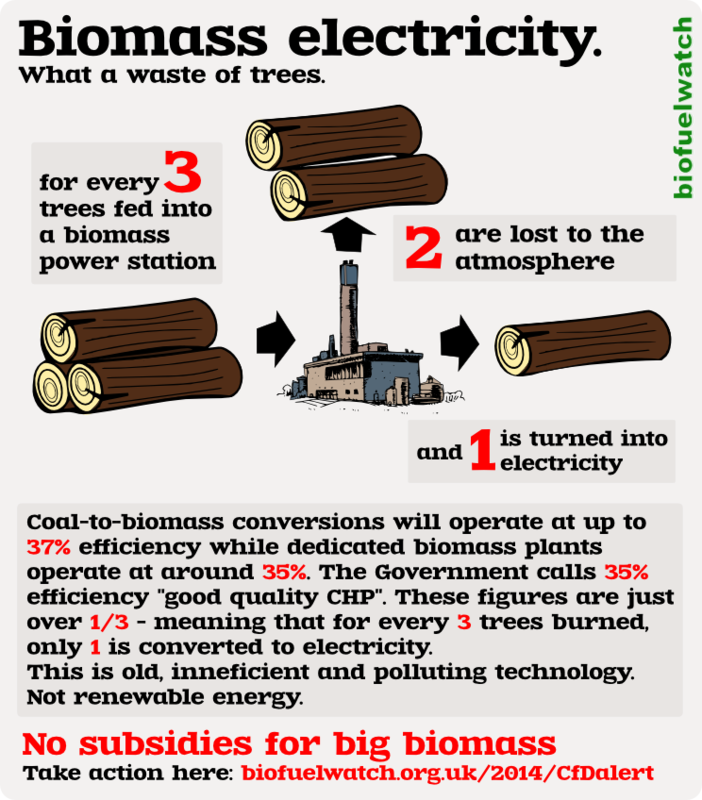 wasting almost two out of every three trees cut down entirely), which use a very minimum amount of heat, possibly even for drying their own pellets or woodchips. Three large and import-reliant power stations have already been approved as ‘CHP’ with no credible plan for delivering heat whatsoever! The UK Government’s proposed Biomass subsidies would be in direct contradiction to the advice to national Governments issued by the United Nations Environment Programme which has called for the phase out of biofuel subsidies and end to targets for Biomass projects. This entry was posted in National News and tagged ancient swamp-forests in North Carolina, Assessing Global Land Use, ‘CHP’, British Columbia, combined heat and power, Contracts for Difference, Drax Power station, http://www.biofuelwatch.org.uk, onshore wind and solar PV, Subsidies for Biomass Plants, United Nations Environment Programme by tamesidegreens. Bookmark the permalink.